White_1_Coin_Envelopes_-_2_14_x_3_12 is rated 3.0 out of 5 by 1. Rated 3 out of 5 by Mattmattmatt from Coin envelopes The envelopes are not very straight and have a few crooked edges. and the company only shipped ups which would not leave the package at the address unattended after numerous times of contacting both the company and ups. So after they should have been delivered it had taken another 6 buisness days. I wouldnt have thought the crooked envelopes were the biggest deal if they had atleast delivered them by when the were needed. Let your smaller items have a cute home to go to with these White #1 Coin Envelopes - 2 1/4 x 3 1/2! Often used for change, rings, necklaces and other jewelry, a cool coin envelope is a handy envelope to keep around the house. When it comes to storing smaller items, coin envelopes are perfect. A classic white is easy to write on and label, which is sure to help you stay organized. You can also use these cute envelopes to give a cute gift, or store your love letter in that bouquet of roses. 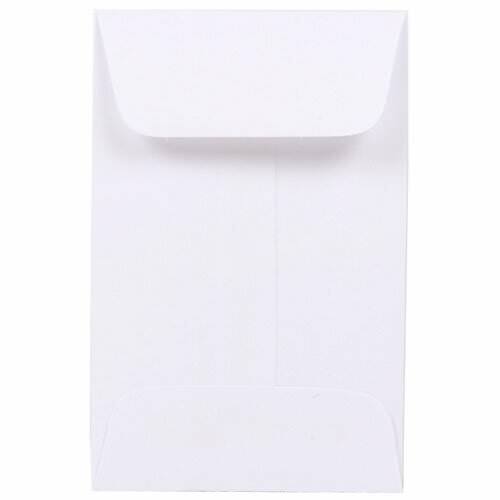 White #1 Coin Envelopes measure in at 2 1/4 x 3 1/2, open on the short side of the envelope (also known as an open end envelope), and are offered in a classic and bright white. Envelopes can be ordered in increments of 100, so you'll be able to get the best quality and the most for your money! Want another coin envelope in another color or another size? Check our collection of coin envelopes found under 'Other JAM'n Products You Might Like'!